Ahh, smell that? That’s the smell of a fresh new update to ThinkSpace! 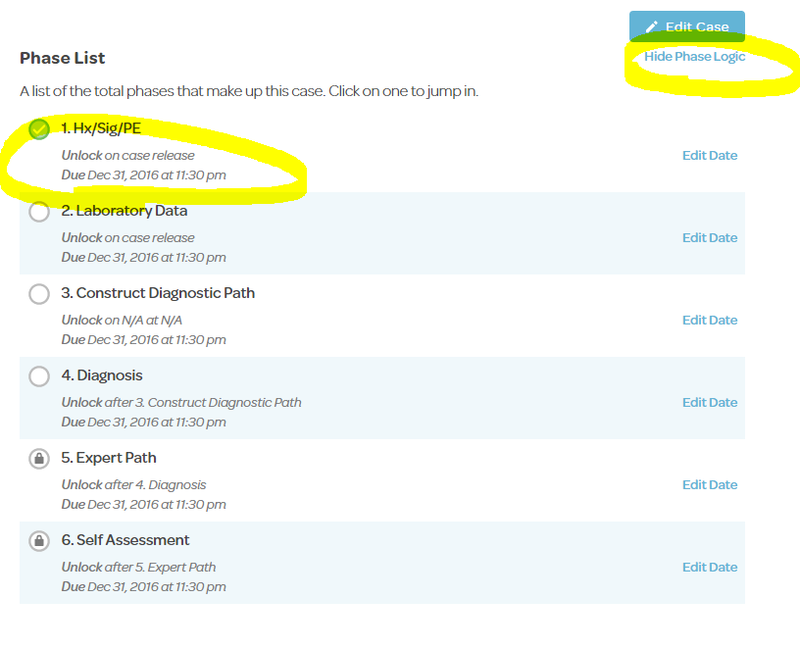 We’ll see some changes with phase logistics (phase due and unlock dates), the ability for students to review past-due cases, better support for multiple tabs and windows, downloadable reports for scores and input data, and more. 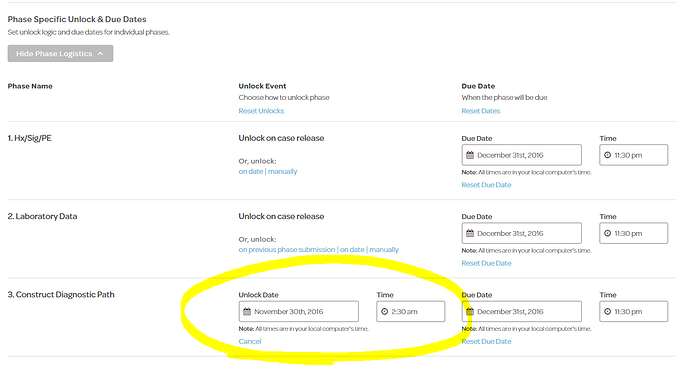 You can still set the phase to unlock: manually, on case release, or on a previous phase submission. All phase due dates supersede any case due dates. For example, if you have a case that is due Wednesday at 5:00PM, but a phase within the case is due Monday at 1:00PM, the phase itself will be due on Monday at 1:00PM. The phase is the at the “lowest level” in ThinkSpace, so they carry the heaviest weight when determining when something will be due. We’ve heard some buzz that students were wanting to review their work, comments, and files from cases that they took in the past. ThinkSpace now allows students to view their work at any time, even after the case is due! When a student views a case that is past-due, it is read-only, preventing any further modifications. ThinkSpace was a bit overprotective when using multiple tabs or windows and it resulted in some erratic behavior. We’ve overhauled the code that relates to this to allow for a much smoother experience. As an instructor, you can now download a CSV that contains all student’s score for a case as well as the responses a student has entered on each phase. The report will only contain scores and inputs from the standard text-based input elements (e.g. single line and text area). We’ve made some changes in the UI, particularly with managing the flow of how a phase is unlocked. 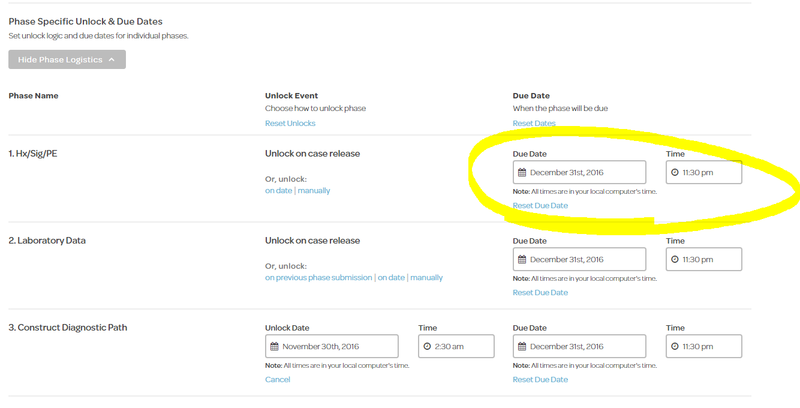 The “unlock next phase” functionality has moved from the phase settings and into the builder’s logistics step. We’ve added the ability to “Show Phase Logic” when viewing a case. This will show the unlocking information for a phase, it’s due date (if applicable), and more to give you a better understand of the logic behind each phase.